Catching Fire greatly improves upon The Hunger Games and that in itself is amazing. I love the first book, Katniss is one of the few characters that I really relate to. Her love for her family and those close to her mean more to her than anything and I'm the same way. Her strength isn't her weapon, it's her will. This book really shows how the fire is spreading and how the people of Panam are ready to be free, to take their lives into their own hands. One of my favorite parts was in District 11 where they all do the hand sign. It just shows how sick they are of suffering and how ready they are to follow a leader. The love triangle, if you can even call it that, is very tame. I know some people who won't even read a book if it has a love triangle because they say Twilight ruined it all. To me though, it's very down played and easy to get through. Katniss isn't really a lover to me. She is a fighter. There isn't a character in this book I really hate (President Snow not included), Haymitch Abernathy, Katiness Everdeen, and Johanna Mason are my favorites though. Haymitch is sweet in his sad drunken way and I'm not sure why but Johanna, there is just something about her I love. I do have a quote from the book that just sends chills through me when I read it or when I hear it in the movie, "Remember who the real enemy is." Overall, this book is breathtaking and amazing. I would never get tried of rereading it. I guess I can safely say that anyone who has ever read Catching Fire by Suzanne Collins, the second installment in The Hunger Games trilogy, will agree to this statement by the The New York Times when they reviewed the book: "Collins has done that rare thing. She has written a sequel that improves upon the first book." Because I do. I one-hundred percent agree. Catching Fire follows the story of Katniss Everdeen and Peeta Mellark's life after winning the 74th Hunger Games. They have everything they could ever ask for: food, money, a house in the Victor's Village, and the relieving known fact that they can never be reaped for the Games again. But a surprise visit from President Snow shakes Katniss's world once again, creating more damage than there already is. Uprisings are transpiring, the simple action of Katniss holding out the berries at the last year's Games is taken as a sign of going against the Gamemakers, against the Capitol. And suddenly, the mockingjay that is once nothing but a district token has embodied Katniss in a completely different way—it has abruptly become a symbol of rebellion. The plot of the second book is utterly well-organized and more than scrupulously thought out. I like that it is more invigorating than The Hunger Games. I also like that it contains a lot of gasp-worthy surprises, which promises an even rousing and thrilling read than the first book. You don't know what you're in for suddenly, just when you think you have a hunch or a prognosis as to what could be happening next. You'll just find yourself saying the same exact words Katniss Everdeen herself stated in the beginning of chapter 13: "I have to admit I didn't see it coming." As for the new characters, I really like how Collins exceptionally characterized and strategically woven each new character introduced into Katniss's life. Johanna Mason (who, hands down, is my most favorite character so far), Finnick Odair, Wiress and Beetee, Plutarch Heavensbee, even all the other reaped victors—every single one of them have different personalities, different way of life and thinking, of beliefs, in comparison to Katniss's, and yet, they merged perfectly well together into this one unbelievable dream team. They form this powerful alliance that has the vigorous potential to become more potent than their cruel regime. Referring back to my The Hunger Games book review, I like how Catching Fire further enhances the Yin and Yang element of Katniss and Peeta. The way they balance each other is what makes them a remarkable pair. While Katniss is not good with her words, Peeta is more than willing to shoulder all the public speaking. When Katniss wants to add her own knowledge in her family's book, but has not done so due to her lack of artistry, Peeta, having been raised in a family of bakers and thus having the necessary finesse, steps in to illustrate whatever it is Katniss wants to add to the book. It is very clear that they need each other more than anyone or anything. Catching Fire definitely is worth the read. It is more dynamic and jarring than the first book, so I really, really recommend it. Even if you somehow satisfactorily savored The Hunger Games, pick up Catching Fire and it may just have enough discerning and intoxicating content (not to mention that terrible, terrible cliffhanger) to change your mind and make you pick up the last installment. The review I wrote for book one is true for this book as well. It consumed me and was incredible. I couldn't put it down. I love how the political is entertwined in the series. Enjoyed all the new characters. It keeps me wanting more. Slow to start but ends with a bang! Suzanne Collins has managed to capture the true inner workings of plotting for a revolution. Take it from somebody who's seen one first hand fairly recently. Collins's story arch rings completely sincere as the second installment of the series explains the fascist regime of the capitol in further detail. [Katinss Everdeen has survived a Games by challenging the authority figures of Panem who refuse to let her get away with undermining them and toss her right back into the arena to meet what is certain to be a gory death as the tributes this times are no set of trembling children. But previous victors of The Games themselves. However, from the very first chapter of the first book you can tell that Katniss is a total Mary Sue. It's a sad fact that most YA literature is based on fantastical characters with deep rooted angst and an adoring fan club that follows them wherever they go. One they are honestly baffled by and therefore have no interest in(or can't make up their minds about). The Gale/Katniss/Peeta triangle is too much of a reminder of Edward/Bella/Jacob for my liking. Some people have complained that the book was drawn out at the beginning, I agree that the events lingered a bit at the start but what do you expect after your protagonist has only just survived a fight to the death? In my opinion, the lag was natural for Katniss to catch her breath and prepare us for what comes next. 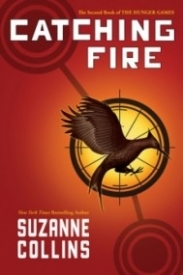 Another solidly written plotline, and a continuation into the universe of the Hunger Games. In addition to the dilemma of kill-or-be-killed, the story becomes steadily more political. Some of the hows, whys, and histories are unfolded into a disturbingly believable scenario. The character development moves along at the pace of events, which doesn't leave you with a lot of easy opportunities to put the book down. I particularly appreciated being able to sympathize with the main character's emotional distress, and the confusion of having her will usurped. It brought up very adult considerations, while avoiding actual adult 'situations' that could easily have been related. I have to give it kudos for making me consider whether humans really do love better, clearer, and deeper when they are free to do so. My only real complaint would be the sense of incompleteness to the ending. This book didn't stand alone, and in a way I felt it forced me into reading the third book. But then, I rather resent cheap cliffhanger tricks. I would have read the third one, regardless! Just as good as the first, maybe better. My fave in the series. Action packed from beginning to end. We find out more about the Capitol. This second book of the Hunger Games series was an important and creative segue from the 1st to 3rd book. It has great momentum, a definite page turner, but I found it not as exciting as the other two books, and parts were a little redundant of the Hunger Games. Don't get me wrong, still an awesome read! All right, all right, all right, stay on your seats please. I was excited to read the second book. I placed this book on hold and had to wait for weeks to get it. I seriously hate that I wasted my energy for this. The first 50 pages were okay, then the author kept rambling on and on and on. This book had very few dialogue, it seems kind of weird when I put it like that. Katniss was just annoying. She simply couldn’t make up her mind about who she loved and she was a coward. I admit, only 2 chapters had me off the edge of my seat. I did not want to put it down and I didn’t want to go to sleep. Then the story just…. falls off from there. Catching Fire. Where do I begin? The Capitol is pissed about the fact that Katniss rebelled against them. President Snow pays a little visit and tells her he knows her love for Peeta is fake; Katniss is trying to keep her calm and says what she did was real in the act of love. ‘Convince me,’ was basically all he says. He threatens her and leaves. Katniss runs to Gale about running away and Gale is excited, of course. Then she tells Gale about having Peeta and them join and Gale gets all whiny, talks about having this war with the Capitol like the other Districts and walks away. Next, Katniss goes to Peeta and basically says, ‘Hey, I told Gale to runaway with me but he said no. So now I’m asking you, screw Gale.’ Peeta, being in love with Katniss, agrees. Suddenly, Gale is caught and getting whipped till the skin on his back is gone. Katniss is screaming and she runs to him. Now the author is going on pages and pages about how Katniss finally makes her decision and chooses Gale and she’s going to stay and fight along side him. The author rambles on again about nothing — for pages and pages. Then Katniss walks downstairs to watch t.v. and the Capitol announces there’s going to be another Hunger Game for the victors (with the previous ones and the new ones), at this, Katniss runs out the house and starts screaming in some damaged building. She changes her mind again saying she’s going to run away, she doesn’t care about anyone else, she cares about herself now. Now I’m angry. The author repeats the same thing when the runners are eating, having meetings, and wearing amazing costumes that makes everyone go crazy. Katniss starts having nightmares and Peeta comes to cheer her up, she talks about Peeta’s warm body, smooth, soft skin and lips. What a second, Katniss is falling for Peeta? She comes up with a conclusion that no matter what happens, she’s getting Peeta out the Hunger Games alive. You’d say she’s brave, I’d say she’s stupid. Katniss is an uninteresting character. Anyway, I had to stop reading on 225. I couldn’t go on. So I started browsing through pages and the whole thing seems as though she plagiarised her first book into this one. I flipped to the last page and she’s with Gale and he tells her, ‘Katniss, there is no District 12.’ and the book ends there. I’m afraid to pick up that third book. What else could she possibly write? She should have just finished it all on the second book. I guess you guys can say I’m crazy for disliking this book. So not enjoyable.